First Colony Winery would be honored to host your special event. 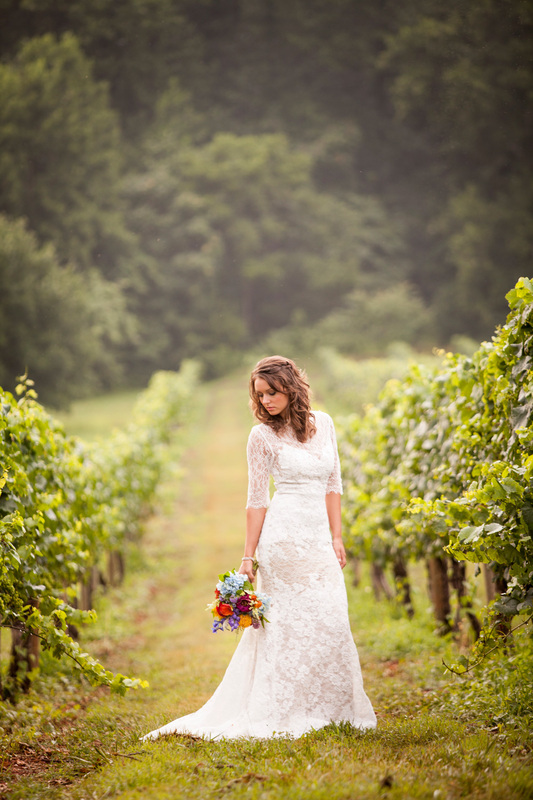 Voted a best winery for weddings in Virginia, the winery offers several venue choices for your celebration. Gatherings may be held in our Tavern Room, Terrace Gardens, the Loft, the Tasting Room, Covered Crush Pad or for the most intimate setting, directly in the vineyard. Our slate patio, Terrace Gardens, two-tiered deck or lawn are ideal outdoor areas for a ceremony or reception of 150 guests. Indoors, our Loft, Tasting Room, and Tavern Room can accommodate parties up to 100 guests, comfortably. First Colony Winery is pleased to provide the following at no additional charge: tables (5’ round and banquet), chairs for the reception, bridal suite, and café lighting in the Loft. First Colony provides a kitchen for your caterer, on-site bus parking, and flexible catering options. A commercial kitchen is located off the Tavern Room and contains all your caterer’s needs to prepare for your special day (oven, 6-burner range, grill, refrigerator, freezer, triple sink, dishwasher, prep tables, and more). The winery offers several venue choices for your celebration. Events can be held in The Tavern Room, The Tasting Room, The Loft, Terrace Gardens, The Winery or on The Crush Pad. For a truly unique experience, a rustic dinner in the vineyard will make your celebration unforgettable. Take a look at our Wedding Planner or contact us to schedule a visit or just to ask questions. What time can I have my wedding? Our pricing guidelines are based on a 6:00PM to Midnight timeframe. We are open to the public until 6:00 pm. Exceptions can be made, but there may be additional charges applied. How many chairs and tables do you have? Are there separate chairs for the ceremony? We have 140 chairs. Many people use the chairs for the ceremony and then have the caterers move the chairs upstairs for the reception. If you prefer not to do this, Festive Fare (info on contact page) has similar chairs available to rent. When can I set up and who is responsible for set up? You can set up the upstairs room the morning of your event. You can also set up any outdoor decorations that do not interfere with our tasting room business the morning of the event. The only thing that cannot be set up early is the tasting room itself. Often, you can even set up the upstairs the night before if there is not another event booked. We try to be flexible with your plans, so please ask and we will work with you. Set up itself is generally done by the wedding party or the catering staff. First Colony staff members are not responsible for set up. If you need to drop off any rentals in the days leading up to the event, please ask us and we can usually find a place to store them. Where do most people have their ceremonies? Is there an additional fee to host the ceremony at First Colony? Many people have chosen to have their ceremonies at First Colony. The most popular place is the slate patio to the side of the building. The patio can fit about 80 people seated. Parties larger than that often set up an arch at the patio’s opening and arrange chairs in the lawn facing the patio. We have also done ceremonies in the vineyard and in the lawn facing the vineyard. If you have an idea of what you would like to do, please ask! We are always open to working with you to create your ideal wedding ceremony. There is no additional fee to have the ceremony as long as it is within the standard timeframe guidelines. Will I be able to have a rehearsal the night before? You are welcome to have a ceremony rehearsal the day before the wedding. We prefer you do it within our business hours if possible. If you would like to hold your rehearsal after hours, there may be an additional fee required. Are there changing rooms for the wedding party? We do have a bridal changing room/ waiting area for the bridal party. All outdoor amplified music needs to be stopped by 9:00PM. Indoors, there are no restrictions. Bands and DJs are welcome. We require you serve First Colony wines at your event. We do allow you to bring in sparkling wine for your toast, although many people have chosen to use our dessert wines for toasting. Outside beer and liquor is allowed as long as you or your caterer has the proper ABC license. If your caterer does not have an ABC license, a one day banquet license can be obtained online for a small fee.